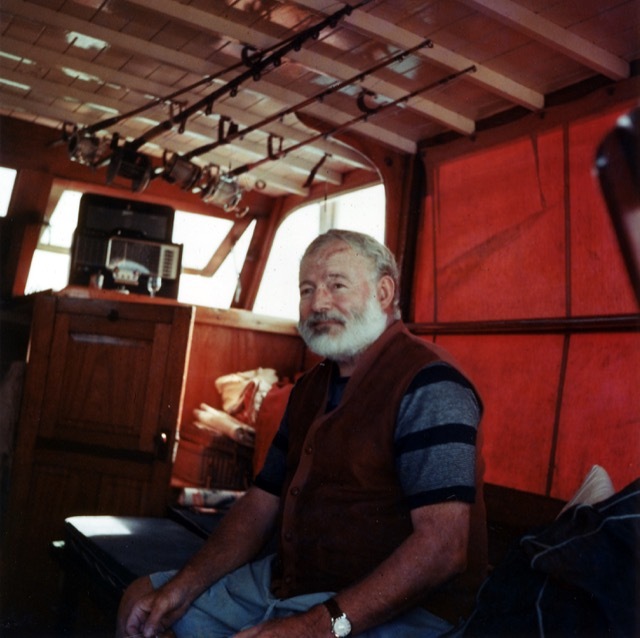 Hemingway on his boat, Pilar, in 1950—a time in his life when he is struggling to write “A Movable Feast” about his first wife and the city they loved. 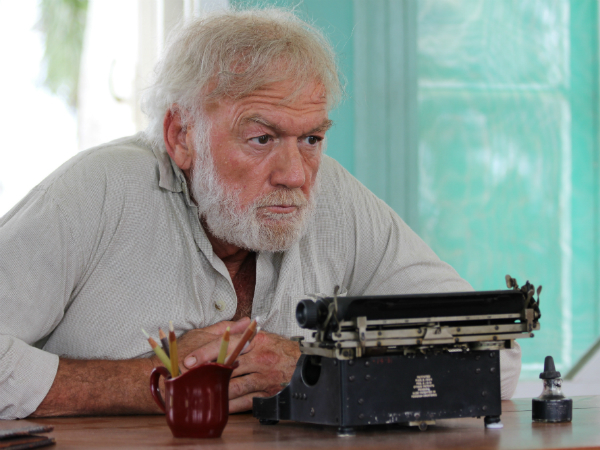 In the film Papa Hemingway in Cuba, Adrian Sparks convincingly portrays Ernest Hemingway during a time when he is struggling to write about his first wife Hadley. His angst is fierce and everyone around him gets caught up in the turmoil, including a young newspaper reporter, played by Giovanni Ribisi. There is a particularly powerful scene in the swimming pool during which Ernest reveals Hadley was the one true love of his life, cautioning the reporter to not take commitment lightly. Giovanni Ribisi arrives in Cuba, on his way to meet his hero, Ernest Hemingway. As they say, hindsight is 20/20—a caveat that applies equally to Hemingway’s advice and the book he was desperate to write at the time. We now know it as A Movable Feast, Ernest’s memoir about his years in Paris as a starving young writer married to Hadley. In writings and interviews, both of them felt they were lucky during that time, though their connection wouldn’t hold in the end. Adrian Sparks plays Ernest Hemingway, his frustration over not being able to write evident in this scene. 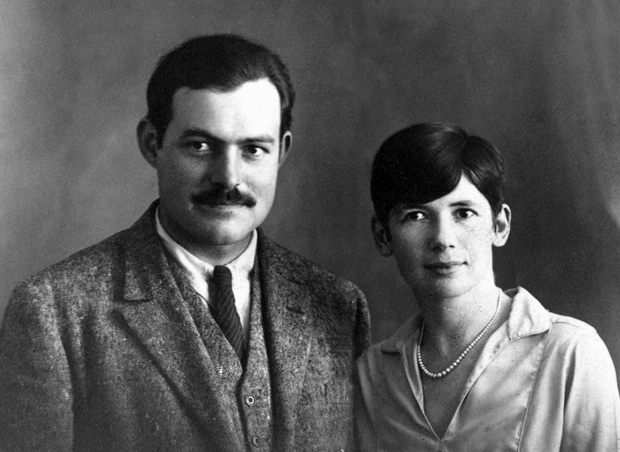 Ernest and Hadley Hemingway in Switzerland in 1922. 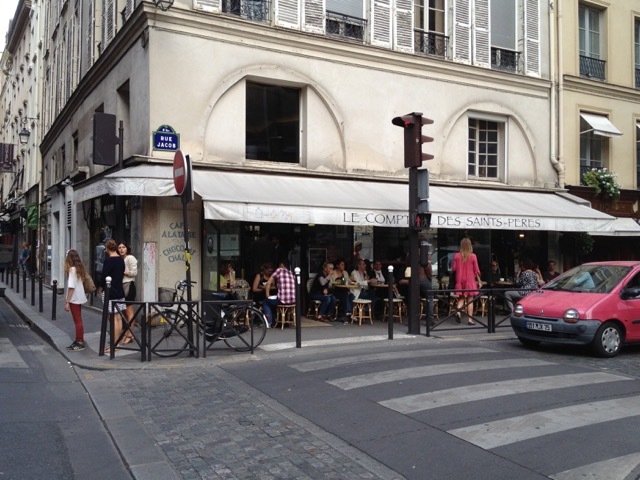 Le Comptoir des Saints-Peres sits at the corner of rue des Saints-Peres and rue Jacob, where Michaud’s used to be—a favorite haunt of the Hemingway’s when they were flush. 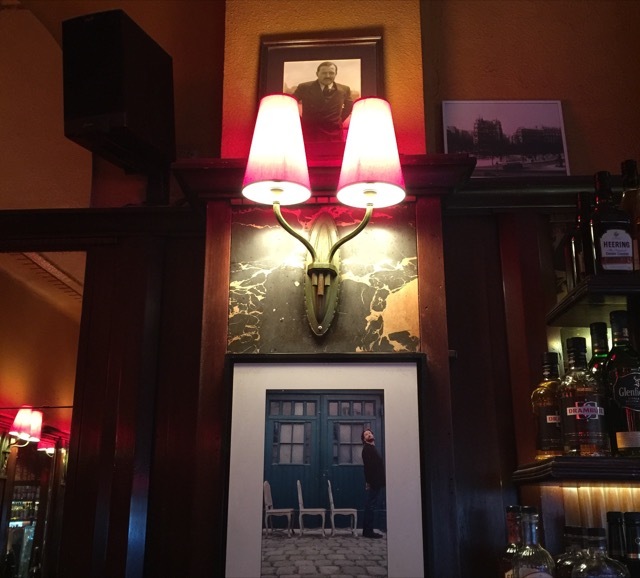 A photograph of Hemingway hangs in his favorite café, La Closerie des Lilas, which I visited during my recent trip to Paris. Nothing was simple in Paris, he wrote, “not even poverty, nor sudden money, nor the moonlight, nor right and wrong, nor the breathing of someone who lay beside you in the moonlight.” You can feel the romantic mood he’s in as he remembers this, and I think the tone would have been markedly different were he not feeling sentimental about his life in general. “We ate well and cheaply and drank well and cheaply and slept well and warm together and loved each other,” he goes on to say. 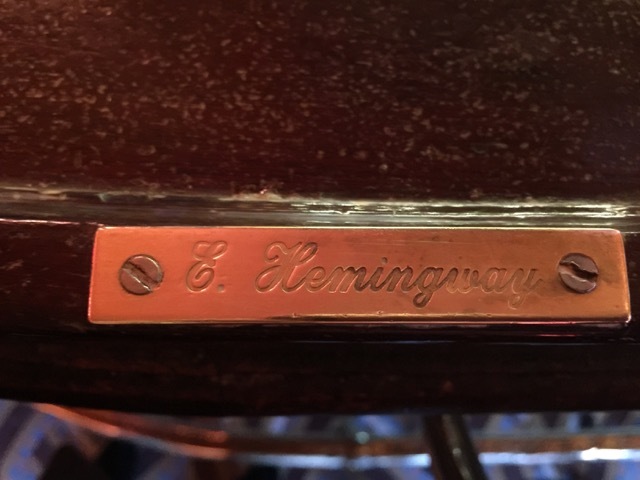 This brass plaque marks the barstool Ernest would occupy on many occasions before going home to Hadley in the evenings. 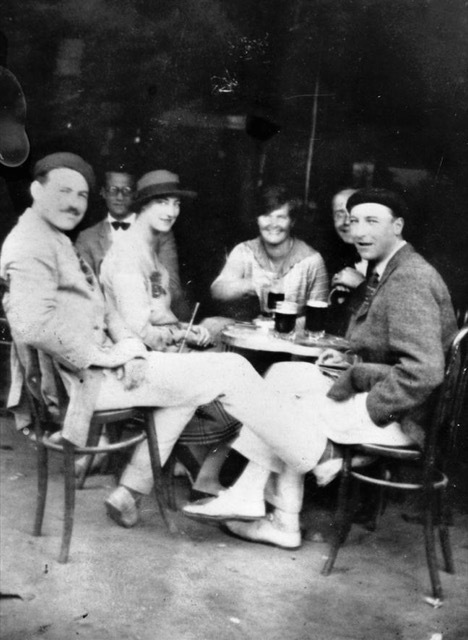 Ernest Hemingway (left), with Harold Loeb, Lady Duff Twysden (in hat), Hadley Richardson Hemingway, Donald Ogden Stewart (obscured), and Pat Guthrie (far right) in Pamplona, Spain, July 1925. An aging Ernest at his writing desk doing what he did best. He declared Schruns a good place to work. “I know because I did the most difficult job of rewriting I have ever done there in the winter of 1925 and 1926, when I had to take the first draft of The Sun Also Rises which I had written in one sprint of six weeks, and make it into a novel.” He reserves the falling apart of his relationship with Hadley for the last two pages of A Movable Feast, not mentioning his affair with his next wife Pauline by name but describing how he believes she moved in on the couple with the aim of coming between them from the start. 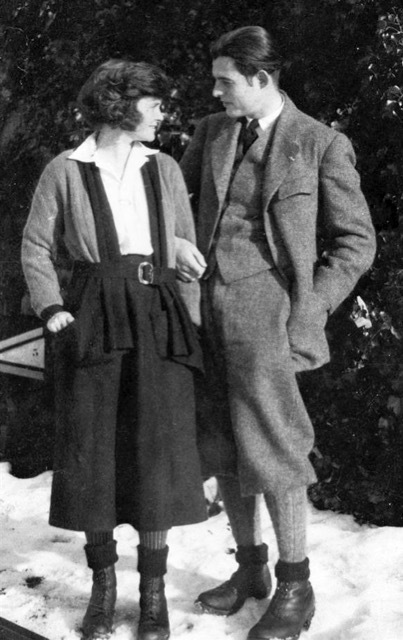 Ernest and Pauline Hemingway in Paris in 1927. 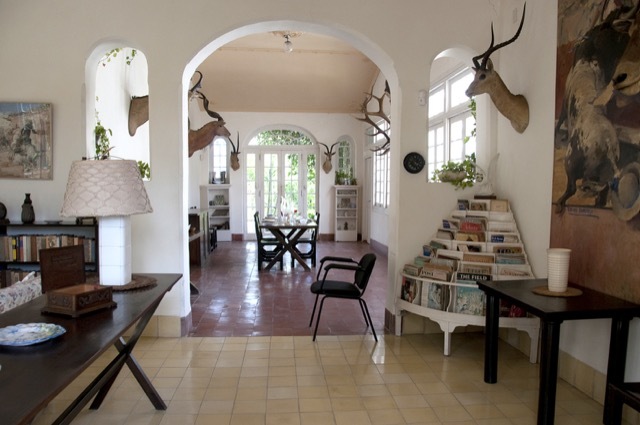 Hemingway’s former home in Cuba, which is now a museum. 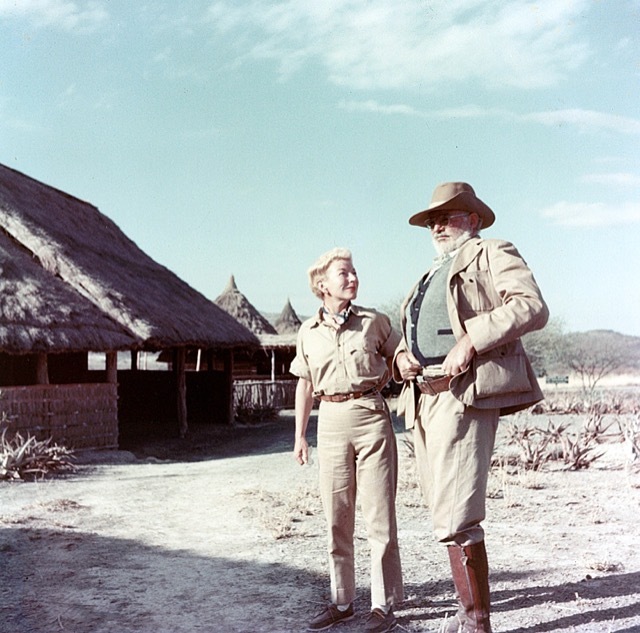 Ernest and Mary Hemingway on safari in Africa, 1953-1954. Photograph in the Ernest Hemingway Photograph Collection, John F. Kennedy Presidential Library and Museum, Boston. He also wrecked his relationship with his second wife Pauline. 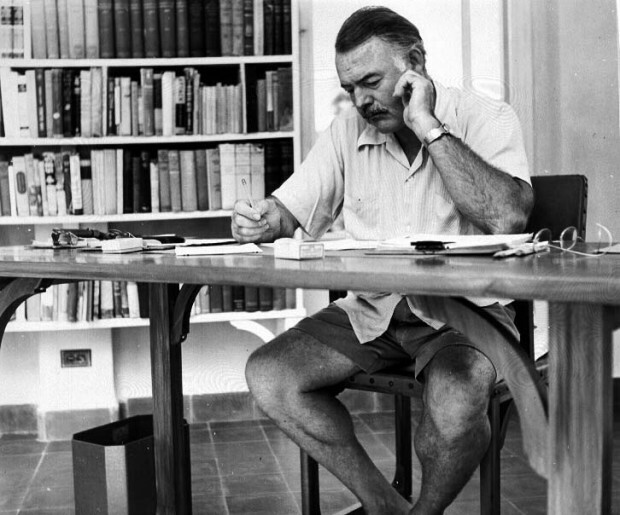 His last wife Mary stayed with him until the very end when he took his own life, though it was far from an easy relationship as Papa Hemingway in Cuba illustrates. One of the things that makes the movie feel so real is that it was filmed in the residence he and Mary called home in Cuba, which is now a museum. Within the crisp white walls, there is an ever-present reminder of his love of hunting, the trophies mounted on the walls staring resolutely into every room. 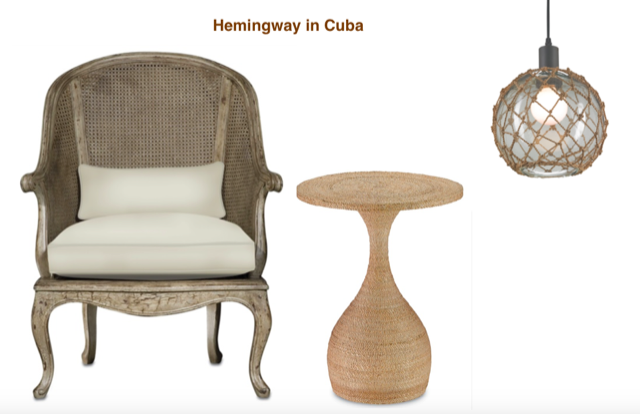 The living room of the Hemingway residence in Cuba. Given he romanced and won three very different women during very different times in his life, I decided we’d do something special for each couple to celebrate their love on this Valentine’s Day. I’ve looked into the Currey & Company catalog to give each of these women and their man something I believe would have cheered them up during their days together. For Hadley and Ernest, it is lovely furnishings they would not have been able to afford during their time in Austria, pieces that I believe would have enhanced their lives aesthetically. For Pauline, I’m honoring her strength as a journalist and her cunning as a woman. 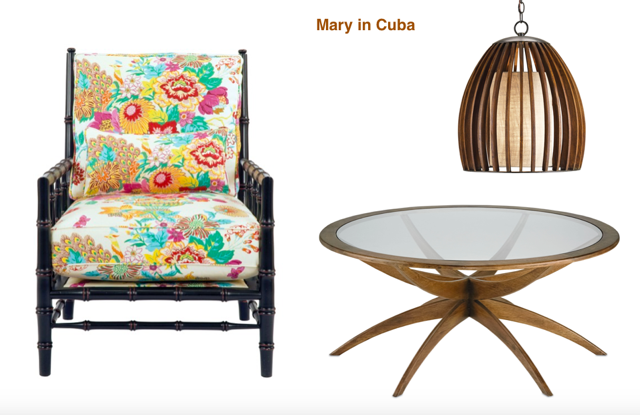 And for Mary, it’s a nod to her great sense of style at home as well as her tenacity. 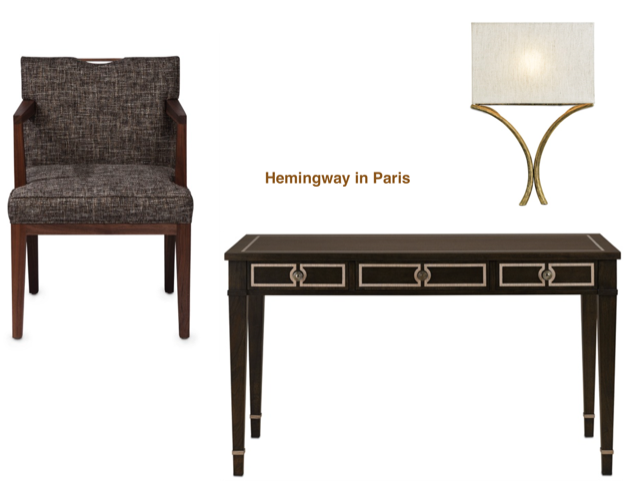 Hadley is curled up on the Tear Drop chair reading, a cup of hot tea steaming from the Boyles drinks table while the luminous Highlight wall sconce in a contemporary silver leaf finish takes the gloom out of the snowy afternoon. 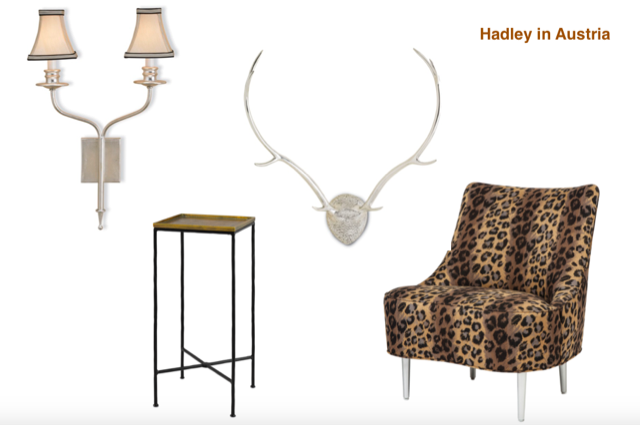 She smiles as she glances over at the Exley wall ornament shaped like luminous antlers, a gift from Ernest whose love of the hunt would grow ever stronger with time. 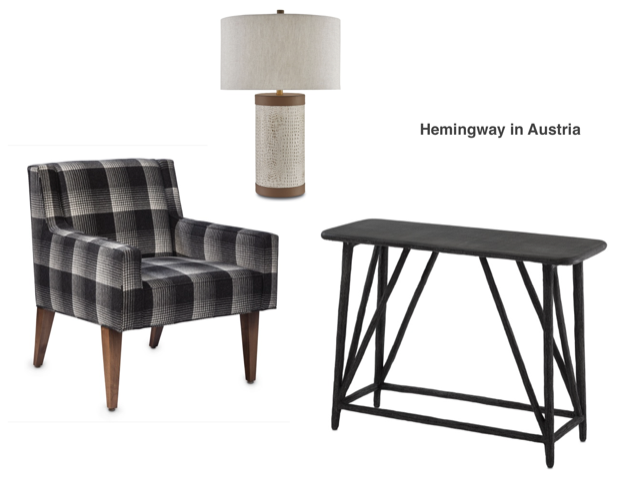 Ernest enters, fresh off the slopes, dropping his hat and gloves on the Arboria console table as he heads for the Sullivan chair, switching on the Baptiste table lamp as he plops into the seat with a drink. Pauline wafts in from a hard day in the trenches at Vogue Paris and tosses the letters she’s picked up from the post office on the Nolan desk. Her feet are killing her after a long day in heels so she perches on the Agora bench to remove them before switching on the Highlight wall sconce in a bronzed gold finish and going in search of Ernest. He’s in his study—seated at the Belden desk, leaning forward in the Monroe chair. The Cornwall wall sconce illuminates the manuscript pages he is editing, his typewriter slid to the back of the desktop as he slashes the paper with his pen. Mary strolls in from a swim, a mottled copy of Vanity Fair landing on the Ellen coffee table as she collapses into the Merevale chair. The glow from the Carling pendant makes her tanned skin gleam in the afternoon light. Ernest has fallen asleep in the Devonshire chair, the empty martini glass on the Simo accent table catching Mary’s eye as she reaches to switch on the Fairwater pendant. Ernest stirs and asks if she had a good swim. Did you enjoy our little Currey & Company make-believe? It certainly was a fun exercise for me. Thanks for stopping by to read and for suspending belief long enough to enjoy the ruse by having these historical figures interact with our furniture and lighting! Saxon Henry also blogs as The Modern Salonnière. 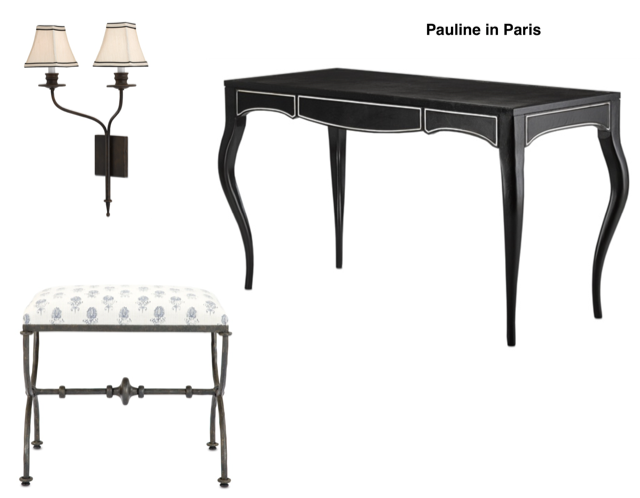 This entry was posted in Currey & Company, Products and tagged black, Floral, Gold, Lighting, Mid-Century, Natural, occasional tables, Rustic, seating, Table Lamp, Wall Sconce, White, Wood, writing desks on February 13, 2017 by Currey & Company.